IWASSA Co.: Patent for writing pad keys "Given!" Obtained by Microsoft. Patent for writing pad keys "Given!" Obtained by Microsoft. 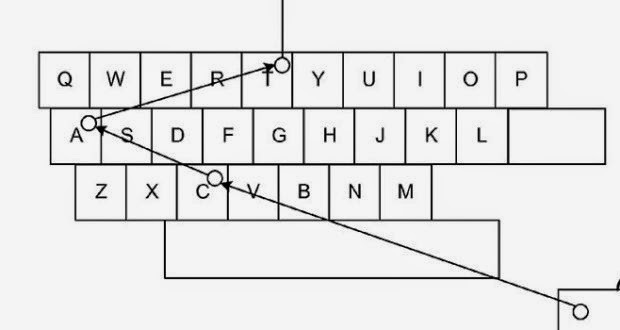 While some of us still prefer to write regular QWERTY virtual keyboard on smartphones and tablets, but there are some who believe that the use of a keyboard like SWYPE is the fastest alternative. And those who did not hear about the SWYPE, she briefly panel keys mastery of writing by passing a finger on the screen without the need for more clicks. Well, while we thought that there is no quicker and easier way, but what if they write with your eyes ?! This is the idea that Microsoft got it patented recently. Microsoft's idea similar to pass the finger, but instead, the system will be able to identify the movements of your eyes, so that users can use to consider only the left and right and up and down to write the words. Any of the systems or devices that you will get this feature? We do not know exactly what Microsoft is planning, but it is likely to be Ardajha in a new device Negotiable wear. Just imagine that you will be able to write e-mail messages or documents from your Google Qlas such as glasses, and using your eyes only. While this idea seems very smart, but that it is a little tired of the eye if it continues to spin continuously in all directions in search of the characters and the various buttons, but to see what are the views of our readers on this unique technology?